The 68th Annual Golden Globes, held in Beverly Hills, California, saw Hollywood arrive in their most glamourous and stylish avatar. We start off the arrivals with Natalie Portman, who's been nominated in the Best Actress category for her work in Black Swan. Looking fit even though he's lost weight, Michael Douglas smiles for the cameras as he arrives with wife Catherine Zeta-Jones. Julianne Moore looks pretty in pink. The actress has bagged a nomination for Best Actress in the Comedy or Musical category for her work in The Kids Are All Right. Desperate Housewives' cast member Eva Longoria looks as glamorous as her onscreen character. Scarlett Johansson gave away the first award for the night, to Christian Bale in the Best Supporting Actor category for his work in The Fighter. Kevin Bacon arrives with wife and American actress Kyra Sedgwick. Nicole Kidman looks gorgeous in white, as she arrives for the awards ceremony with musician husband Keith Urban. The actress has been nominated in the Best Actress category (Drama) for her work in Rabbit Hole. Jake Gyllenhaal bagged a nomination in the Best Actor (Comedy or Musical) category for his work in Love & Other Drugs. Brad Pitt and Angelina Jolie strike a pose for the camera. Bruce Willis holds his young wife Emma Heming's hand, as they walk down the red carpet. Singer Seal and his beautiful supermodel wife Heidi Klum walk down the red carpet. 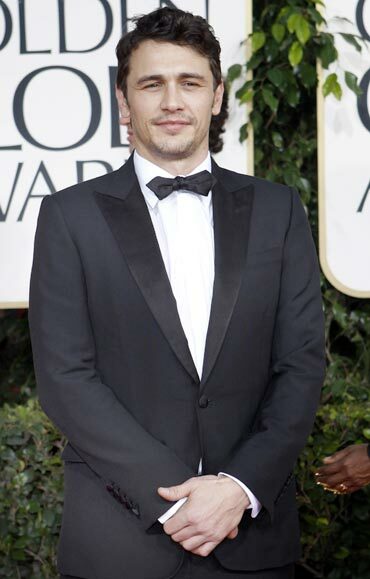 James Franco seems to be the flavour of the season. Will he take tips the Golden Globes host Ricky Gervais, for his turn at the upcoming Oscars? Halle Berry shows off her shapely legs in her black gown. She has bagged a nomination in the Best Actress (Drama) category for her work in Frankie Alice. 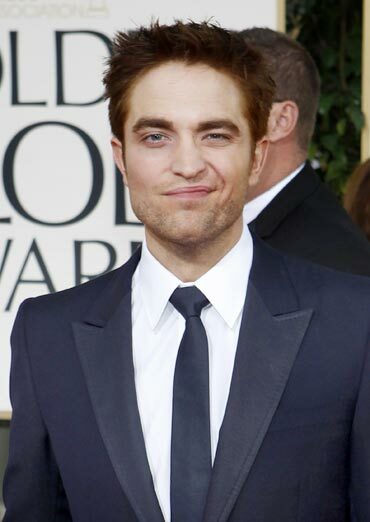 Twilight hunk Robert Pattinson makes a face at the cameras. High School Musical star Zac Efron shows off his crew cut at the red carpet. Will Johnny Depp be lucky this time around? The actor has been nominated in the Best Actor (Comical or Musical) category for his work in Alice in Wonderland. Megan Fox gives the cameras a scorching look, as she walks down the red carpet. Singer Marc Anthony walks alongside his stunning wife Jennifer Lopez. Tom Hanks arrives with wife and actress Rita Wilson.